EXC 30GT model is the 30W exciter of the innovative GT family produced by Sielco. It is appreciated for the great efficiency and versatility due to three main reasons: LIGHT weight, MINIMUM size and LOW consumption. To buy an EXC 30GT, as anyone other model of the GT line, means to make a winning choice, to enjoy all the relevant advantages during all the life of the product and to spare money: less transport costs, less needed space to install it and the lowest energy consumption during the work. EXC 30GT is simple to set up: very easy to configure thanks to the intuitive human interface equipped with an elegant LCD graphic display, a multifunction jog control and only a few other control buttons. The high flexibility of this exciter could be even increased through the use of important options like: telemetry/remote control systems, Ethernet connection with SNMP protocol, high quality stereo encoder, audio digital board in accordance with AES/EBU directive and RS232/485 serial port to enable an easier integration with other instruments. The modern and attractive design of our GT transmitters reflects the state-of-the-art technology of this trustworthy model that requires a few maintenance and that allows to spare time and money. N.B. 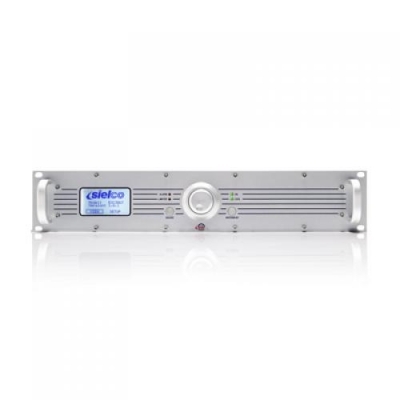 : the amplifier characterized by the code RFB needs an exciter like our EXC30GT as driver. The two apparatus linked together compose the so-called combined transmitters characterized by the prefix code TX.